PRESS RELEASE: The seminal RØDE NT2-A Variable-Pattern Condenser is now shipping bundled with a range of accessories, but at no increase in cost. Introducing the NT2-A Studio Solution Pack. 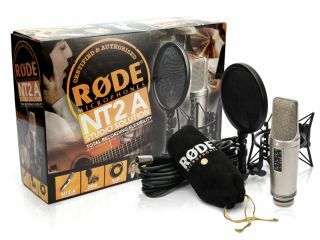 The NT2-A carries on the tradition forged by the now legendary RØDE NT2, featuring a professional large 1" capsule studio microphone incorporating three-position pick-up patterns, PAD and high pass filter switches conveniently located on the mic body. What's more, the NT2-A is 100% manufactured in Australia and comes with RØDE's standard 10 year warranty. The NT2-A Studio Solution Pack is now in stock and ready to go. Check one out today!